Fukushima Study Links Children's Cancer To Nuclear Accident : The Two-Way The study says rates of thyroid cancer are high for children who lived near the tsunami-crippled nuclear plant in Japan. But other scientists are skeptical of the findings. A doctor examines the thyroid of a child at a temporary housing complex in Nihonmatsu, about 31 miles from the tsunami-crippled Fukushima Dai-ichi nuclear power plant, in 2013. But independent experts say that the study, published in the journal Epidemiology, has numerous shortcomings and does not prove a link between the accident and cancer. The work, led by Toshihide Tsuda of Okayama University, is based on a large public health survey that was set up in Japan's Fukushima prefecture following the accident. As part of the survey, children who were living near the plant at the time of the accident have been offered regular thyroid screenings. In the past year or so, the Fukushima Health Survey of more than 150,000 children has turned up 25 "suspicious or malignant cases" of thyroid cancer. Thyroid screenings in previous years have also found numerous cases. 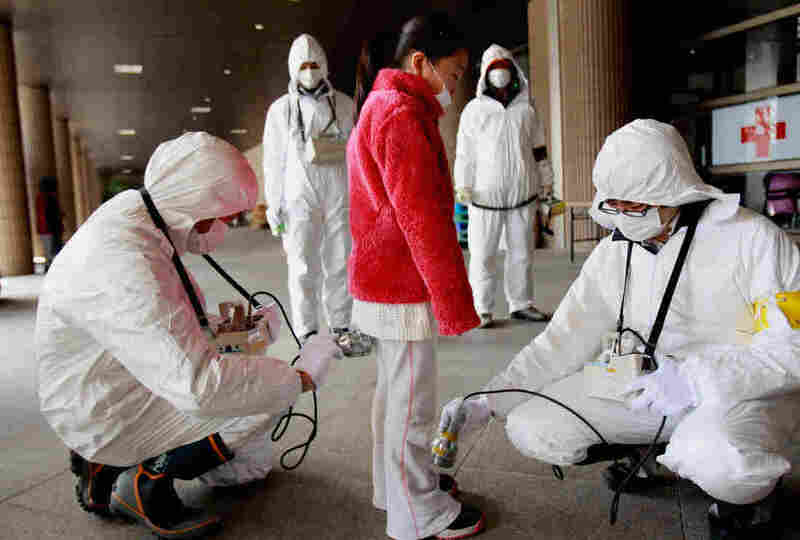 A child is screened for leaked radiation from the Fukushima Dai-ichi nuclear plant in Japan's Fukushima prefecture on March 24, 2011. But the new paper contradicts that view. The increase in cancer is "unlikely to be caused by a screening surge," the paper says. It says thyroid cancer rates are highly elevated throughout Fukushima. Other researchers are skeptical of the new result. Geraldine Thomas, a professor at Imperial College who has studied thyroid cancer from Chernobyl, says the analysis incorrectly compares the screening in Fukushima to clinical cases of thyroid cancer in which patients are already sick. The comparison falsely suggests thyroid cancer in Fukushima is elevated by as much as 50 times compared with the general population. "This is not a very good paper to be basing opinions on," she says. More accurate comparisons between residents within different parts of Fukushima prefecture show no statistically significant variations in cancer rates, she says. David Brenner, director of the Center for Radiological Research at Columbia University, adds that the study makes no effort to trace the exposure of patients. "It's simply relating geographic regions to cancer risks and not looking at individual radiation doses," he says, adding that without that information, it's virtually impossible to connect the screenings to the accident. "It really doesn't tell us the whole story," he says.